Here's just a quick peek at one of the cards that we will be stamping on Monday, Aug 22nd & Tuesday, Aug 23rd's Coffee, Cards and Biscotti Class. Isn't it totally stinkin' cute? I really think you deserve a little time in my Happy Place. You should totally come to class. How can you go wrong with stinkin' cute cards, Coffee and Biscotti? What's not to like. 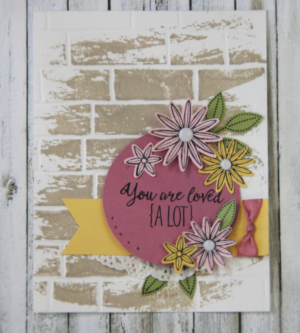 Loved the Grateful Bunch Stamp set with the Brick Wall embossing Folder. Come to class and learn to make such a cute little card!